court sejour a bangalor ... Sumanjay homestay est tres bien situé dans bangalore en étant juste a 10min a pied de la MG road tout en etant dans un quartier super calme avec un tres beau petit marché local a deux pas. Welcome to a whole new experience in hospitality - the ethnic Indian home stay. An innovative way to stay in Bangalore, the garden city of India. "Sumanjay" bring the warm comforts of a home and yet the luxuries of a hotel stay. Cost-effective, convenient, co-operative and personal - a beautiful memory for your travelogue. We can arrange or help you arrange your itenerary keeping your base at our homestay in Bangalore. Sumanjay is a clean and comfortable home. You can enjoy our home cooked meals at no extra cost (breakfast). The bedrooms have attached bathrooms with hot and cold water facilities. Our house keeping department has cleanliness as their motto. Breakfast : South and North Indian breakfast... wholesome, non-greasy, non-spicy vegetarian fare. Experience the sensational buzzing city at its best and yet retire to the serene, quite peace of your own home. You can also branch-out to other states of India beautiful Kerala, beaches of Goa, Aurobindo Ashram at Pondicheri, or the port city of Chennai. Sumanjay is a clean and comfortable home. You can enjoy our home cooked meals at no extra cost (breakfast). However, the kitchenette is also at your disposal in case you feel like cooking. Breakfast and dinner: South and North Indian home meals of wholesome, non-greasy, non-spicy vegetarian fare. Packed lunch, evening tea and beverages on request. 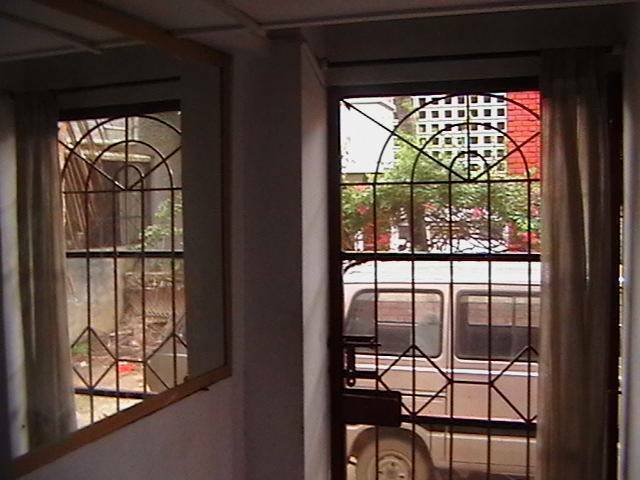 Rooms are comfortable, homely and clean with attached baths, hot water, shower facilites. Satellite television, refrigerator, microwave and internet available in common room. The property is very well located in the city centre in the City of the state capital, Bangalore in the state of Karnataka. We are very close to M. G. road, the shopping paradise of Bangalore. The local markets and all amentities are close by as is the railway station and airport. Whitefield, IT hub and Sai Baba ashram 30 kms. Pondicheri, Aurobindo Ashram and beaches, 300 kms. Excellent South indian vegetarian food. Airport pick up is available at a nominal cost of One thousand one hundred Indian Rupees . You can also hire a taxi to the accommodation. Ask for Cambridge Road. On Cambridge Road, ask for the Vijaya Bank. At Vijaya bank take the left turn, if you are approaching from the Ulsoor Police station. After about fifty yards distance forward, take the first right turn which in a dead-end after fifty yards. The last house on the right is Sumanjay Homestay. You can use the taxi, auto rickshaw to go to all places within the city. The city buses are also available and the bus-stops are close by.